Peptide ETEKPRGYQMSTRLK(C), corresponding to amino acid residues 385-399 of rat NMDA receptor 1 (Accession P35439). Extracellular, N-terminus. 1. Anti-NMDAR1 (GluN1) (extracellular) Antibody (#AGC-001), (1:600). 2. Anti-NMDAR1 (GluN1) (extracellular) Antibody, preincubated with the control peptide antigen. Immunohistochemical staining of perfusion-fixed frozen mouse brain sections using Anti-NMDAR1 (GluN1) (extracellular) Antibody (#AGC-001), (1:200) and Anti-CALHM1-ATTO-594 Antibody (#ACC-101-AR), (1:60). A. Sections were stained with Anti-NMDAR1 (GluN1) (extracellular) Antibody, followed by goat-anti-rabbit-Cy2 (green). Staining reveals expression in neurons of the pyramidal layer (an arrow points at the layer). B. The same section was incubated with Anti-CALHM1-ATTO-594 Antibody (red). C. Merge of the two images demonstrates colocalization of NMDAR1 and CALHM1 in pyramidal neurons. Live intact rat hippocampal neurons (1:300). See Mikasova, L. et al. (2012) Brain 135, 1606. Increased Synaptic GluN1/mGluR5/Homer1 in Fmr1-/- Mice.Immunocytochemical staining of mouse hippocampal neurons using Anti-NMDAR1 (GluN1) (extracellular) Antibody (#AGC-001), (red). 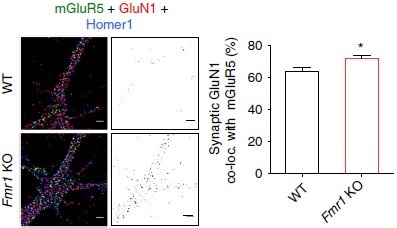 Triple immunostaining experiment indicates increased synaptic clustering of GluN1, mGluR5 and Homer1 in Fmr1 knockout mice.Adapted from Aloisi, E. et al. (2017) Nat. Commun. 8, 1103. with permission of SPRINGER NATURE. Anti-NMDAR1 (GluN1) (extracellular) Antibody (#AGC-001) is a highly specific antibody directed against an epitope of the rat protein. The antibody can be used in western blot, immunocytochemistry, live cell imaging, and immunohistochemistry applications. It has been designed to recognize NMDA receptor 1 from rat, mouse, and human samples. Rat living and intact hippocampal neurons (1:300). Aloisi, E. et al. (2017) Nat. Commun. 8, 1103. Oh, J.Y. et al. (2017) Neurosci. Lett. 649, 41. Jezequel, J. et al. (2017) Nat. Commun. 8, 1791. Guinea pig Anti-NMDAR1 (GluN1) (extracellular) Antibody (#AGP-046) is raised in guinea pig and can be used in immuno-colocalization studies in conjunction with any of our antibodies raised in rabbit. This antibody has been raised against the same epitope as #AGC-001.